Moissanite is spectacular jewel surpassing diamonds in many ways. Let's check few of the most beautiful radiant cut moissanite engagement rings! There are many reasons why couples prefer moissanites to diamonds and to many of them lower price is not the most important factor at their decision. Moissanite is created in labs and thus without the luggage which so often accompanies diamonds, often mined in controversial situations. It also offers more luster, fire and brilliance than diamond. With 9.25 points on Mohs scale it is harder than any other gemstone used in jewelry with the exception of diamond (with perfect 10 on the scale). This makes it very durable and extremely appropriate for use in a ring, jewelry piece which is typically exposed to the most stressful conditions. 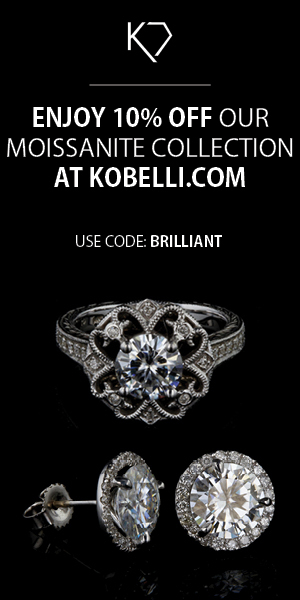 Featured ring designed by acclaimed jewelry designer Kobelli puts 1.80 carat moissanite in the center of attention. It's charm is further emphasized with numerous small white natural conflict-free diamonds (0.25 carats altogether) arranged in halo and around the 14 k white gold setting. Central stone is Forever Brilliant by Charles & Colvard, patented method for creating nearly colorless stones even at larger sizes, what almost two carats (8 x 6 millimeters in this case) definitely is. Moissanite is very durable stone and can be scratched only by other material made of silicon carbide (chemical formula of moissanite) and diamonds, so it is much more appropriate for engagement rings than significantly softer cubic zirconia or even sapphires and rubies. Cleaning and maintenance is very similar to diamonds. Charles & Colvard offers limited lifetime guaranty on all their stones. This ring had slightly smaller stone (1.20 carats) of slightly lower quality. VG mark stands for very good, what is still high class jewell, although not as clear as Forever Brilliant above. There are no diamonds to emphasize its beauty in this case. Set in 14 k white gold in elegant timeless design it is definitely less showy than other presented rings on this page, yet stuns with its brilliance and originality. Radiant cut with strategically arranged facets make the most of the stone's beauty and surpasses related and more traditional emerald shape in brilliance. Thanks to trimmed corners we can say this shape in some way joins the best of both worlds: of round and rectangular cuts. If you like the design, but would prefer enhanced stone (Forever Brilliant instead of VG), this is might be possible as well. Just inquire. Like all other rings in the article, this one comes with jewelry gift box and certificate of authenticity. If you prefer more massive settings, this round moissanite ring in Kobelli's design may be the one. It's clearance is well supported with 14 k white gold. Gem has 1.80 carats and is of VG quality with possibility to upgrade (please, inquire). As you probably noticed white gold is preferred setting at this type of jewels. Reason is simple. While yellow and rose gold have their own charm, it is only white (with additional polish) color which makes the most of clarity of moissanite. With colored gold otherwise clear stones would necessary look slightly colored. The same principle is used at diamonds too. In general colorless gems are more valuable because their clarity suggests absence of imperfections. Of course some customers prefer colored stones anyway, but we should distinguish between colored and clear with inclusions. At moissanites yellow and green colors are by far most often. In recent years fanciful pink joined the family. A beautiful example of colored moissanite is presented below. If you are looking for a bit more extravagant but still extremely elegant bridal jewelry, this moissanite stone of 1.20 carats of VG quality in prong setting with split shank band of 14k white gold. The central stone of radiant cut is displayed in setting of additional round diamonds (paved) of 0.33 carats altogether (halo + band) what results in a breathtaking design signed by Kobelli. There is also an option of engraving (up to 15 caracters), if you already made a final decision. There is one very important advantage at on-line orders - you can actually wear the ring at different conditions and check how it looks at different times of the day. At moissanite it is particularly important to see its unmatched brilliance at daylight, which can't be completely noticed at jeweler's store under the artificial light and almost laboratory conditions. All presented rings come with money-back guarantee, so there is really nothing to loose. Check at Kobelli.com (click photo) for details. If you want to kill two birds with one stone, a bridal set of engagement ring with matching wedding band, could be the answer. The ring of the bride-to-be is dominated by large radiant cut moissanite with dimensions 9 x 7 millimeters (2.75 carats) and accompanied by natural diamonds (0.25 carats altogether) of conflict free origin. White diamonds of GH colors and I1-I2 clarity are set in halo and on the band as well. Engagement ring comes with two contoured diamond wedding band which makes a perfect match on bride's hand. More or less twisted designs are very fashionable right now. There are 0.40 carats of diamonds altogether and both rings are made of 14 k white gold. All radiant moissanite bridal rings are resizable from size four up to ten or eleven (check at the ring of your choice). One more thing. While radiant shape is known to flatter almost all shapes of hands and sizes of fingers, there is a chance it doesn't fit perfectly on larger, heavier hands, especially if the wider shapes of stone are in question. Anyway, such beauties are always worth a try.